* Our beautiful Antique Crystal Wedding Comb has vintage style at a fabulous wholesale price! 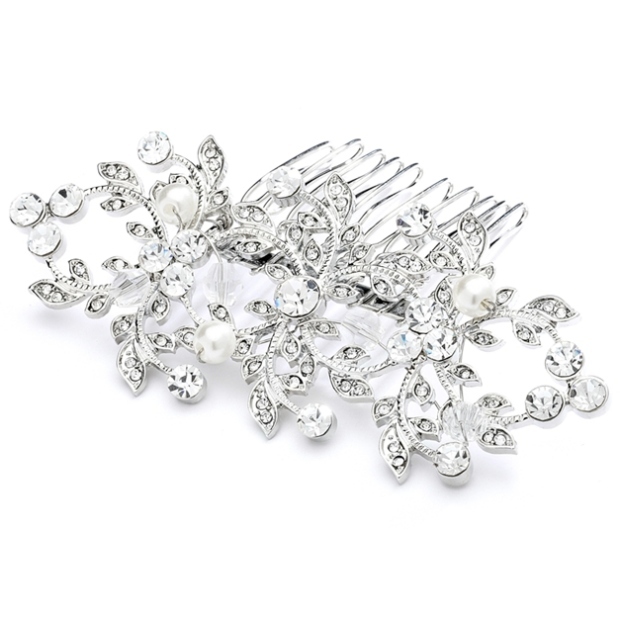 * This retro bridal hair comb boasts silver leaves, sparkling crystals & ivory pearls. * Our 3 5/8" w x 2 3/8" h hair accessory looks great with a chic birdcage veil! * This elegant heirloom style bridal hair comb is a must have for every retailers and stockists wedding hair accessory display. * This top-selling comb is sold at an unbelievably low wholesale price to appeal to every budget. * Mariell's comb is beautiful worn alone but is priced so it can be purchased as a pair to make a dramatic fashion statement. * Wear this pearl and crystal comb with one of Mariell's popular face veils or vintage birdcage veils for a great retro glam wedding headpiece.